Fiji's law profession has taken another battering with the fiasco involving Renee Lal, Amani Bole and Jamnadas Associates but plenty more are heading into the job. Twenty one law graduates were admitted to the bar on February the 4th, among them the former senator, Dr Atu Amberson Bain. 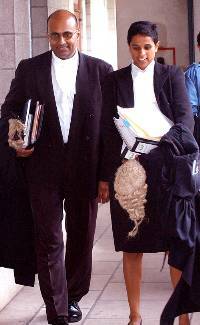 Doing the honours was the illegal Chief Justice, Anthony Gates, who urged the newbies to use their skills to help the community and to avoid controversies. That speech is far too late for the likes of Ana Rokomokoti, the former Iron Lady of the Fiji Military who is trying to salvage her career by opening her own law firm in Nabua, Suva. Rokomokoti was given the push at the end of last year by the illegal regime, losing her job first as the Chief Registrar of Fiji's tainted judiciary (she was replaced by a Sri Lankan expatriate) and then finally shuffled out of the army altogether. One of her mates had been Pita Driti but the deposed Land Force Commander was unable to save her, let alone himself. Close buddy Brigadier General Mohammed Aziz was once a protector, too, but he's also been brought to heel. In fact, we hear thanks to having a finger (or is it gorging?) in several lucrative pies, Aziz is about to be sent to far away lands - Brazil where he'll be Fiji's new ambassador. The appointment is being described as a 'face saving' exercise for the hierarchy. 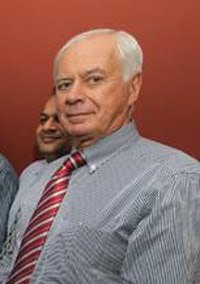 Talking about departures, the former publisher of the Fiji Times, Dallas Winstead, seems to have a story to tell, though whether he coughs remains to be seen. He's posted the following open letter on the blog, Café Pacific, and it makes for interesting reading, though some of what he says, and hints at, is known to us. Note the tone of disenchantment in his letter towards the end. People keep telling me I’m getting the occasional mention on blogs (which I don’t read). Anyway, it would be a good idea to share with anyone who is interested why I left The Fiji Times. 1. Motibhai, the new local owners of the paper, could not organise insurance nor medical evacuation for me, a requirement of our contract. 2. This became an issue for both them and I and they agreed to pay out the remainder of the work permit, four or five weeks. 3. I am tremendously proud, in fact exhilarated, by what I achieved with the full-blooded co-operation of some 160 The Fiji Times employees, as they embraced the job of resuscitating the newspaper the government intended to close. 4. The newspaper published its editorial charter on October 9 in which we stated that we supported the Prime Minister’s dreams of One Nation One People. We made it clear we would not be kissing arses but nor would we be instinctively kicking them. Like every decent paper in the world, we have kept that promise. 5. The government continues to subsidise the opposition newspaper, the Fiji Sun, with about 3000 pages of advertising a year. In return it publishes verbatim, mostly, all government releases. It is a shameless, even dangerous, publication. 6. Depending on what happens in Fiji in the weeks ahead, I may, or may not, fill in the details of that journey other than to take this opportunity to thank those dozens of the business, academic, legal, diplomatic and public servicemen and women who shared frank and revealing conversations with me about the way Fiji works. So Dallas. Have you worked out what a human rights abusing dictatorship is yet? Why did you take up a job in such a feral regime in the first place? And you have finally worked out that the Fiji Sun is a dangerous publication and just a mouthpiece for the illegal junta and its criminal cabal? Are you a slow learner? Motibhai couldn't organise insurance and medical evacuation!? How sad is that! I just hope he's not revealing the details of his journey to protect the innocent and not to protect the thieving regime. Well hopefully someday. Poor, poor Winstead didn't think it was as bad ashea heard but it was, eh? And then to top off - Motibhai holding out on his insurance and medical evac? Cheated, huh? Welcome to my world, Big D! What does this tell us about MacP? And the war for advertising reveue between the FSun and FTimes? Lost cause? Luck to the new sucker in the publisher's chair. Who controls the money controls the show. Who kisses arses gets the cream. Real life lessons learnt in real time. Things don't look rosy as they appear from the outside as Mr Swinstead sadly found out. You've got it right Dallas - Fiji Sun, shameless and even dangerous! Unfortunately Fiji Times is gaining on them in those stakes! It's a mouthpiece for the dictator Dallas, just like the other rag in Walu Bay. What arse have you kicked? You got one up yours for sure. The Fiji Times staff are oppressed and suppressed and here you are trying to give it all a facetious spin. Well up yours mate and sorry we couldn't give you all the benefits you definitely did not deserve. Tainted muslim envoy representing predomintey methodist country in devoutly catholic Brazil. After drawing up a will for an close elderly relative - lawyer asked for $200 fee - which relative consequently paid via 2 freshly printed $100 notes. After the client had departed the lawyer seperated the notes and realised his elderly relative had inadvertly paid him $400. Now a great ethical dilema began swelling within the lawyers breast - should he tell his partners? Hey, Dallas what do you know is going to happen in the next few weeks that will make the difference of whether you;ll detail this journey of yours???? Thats why Hari Punja has his own insurance company! @ "Couldn't lie straight in bed". that was very funny. Good twist at the end there. Reminds me of what the good book says "For the LOVE of money is the root of all evil". Unfortunately in Fiji it's not just the Lawyers who have the LOVE of money. Now we can see what Bai was intending to do all along. He wasn't intending to weed out corruption. He fooled a lot of dumb people, who are still following him around. People like Gates, Pryde etc etc. These people should ALL go to Naboro for colluding. The relationship of the Fiji Sun to the Illegal Regime is like a sanitary pad [Fiji Sun] to a woman [Illegal Regime] - hiding, filtering, containing, encouraging what is flowing out!!!! Here's one for all you constitutional & bush lawyers. Aziz now holds a diplomatic passport - does this entitle him entry into the US - EU Australia & NZ etc? Legal Q - nona Az ga!! That ILLEGAL diplomatic passport, in REAL time is not worth the piece of paper it is written on. It has been designed and approved for use only when travelling to China, Cuba and North Korea!!!! Silly Ana, sold herself to the Devil for nothing ! Mark - Why pity Ana? She chose that path and she has now gotta pay? There are no freebies in this life. You reap what you sow. The higher you go the harder you fall. Every kuta has its day! !